Ever wonder what those funny labels mean on the packages of the food you buy? Or hear about the importance of serving sizes or portion sizes? Then hopefully this post will be answer some of the questions you have and provide some tips for the future. 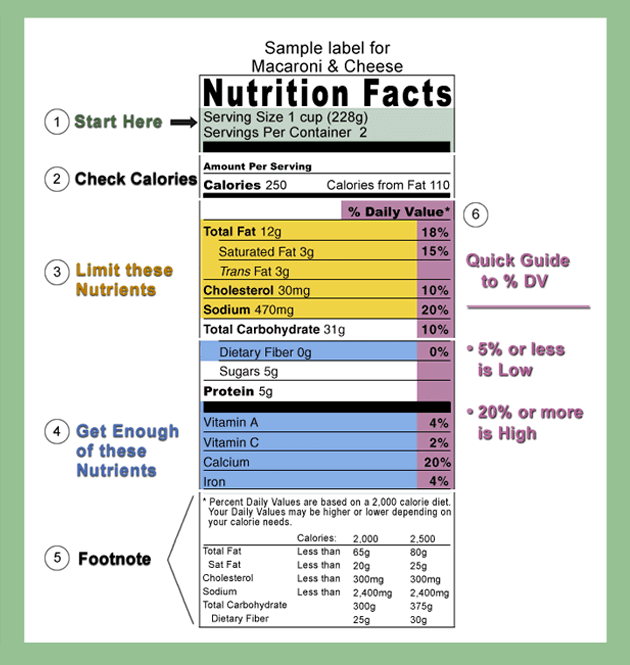 The Nutrition Facts Label points out the important categories and how to interpret the information. Food labels can be tricky if you don’t know what to look for. The labels are honest and regulated, but there are strategies to hide not so pleasant characteristics of particular products, so I have included some tips to consider when you are shopping for food and trying to pick the most wholesome product that is truly nutritious. Tip #1: Check the “Serving Size” and “Servings per Container” before looking at the nutrients that the product contains. 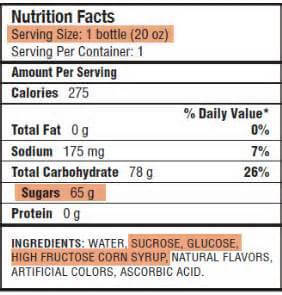 If we look at a particular line and see that there are low grams of sugar we think it may be a good option but if the serving size is 1/4 Cup and we typically eat 1 Cup worth, then we would need to multiply the grams of sugar by 4! Tip #2: Check the % Daily Value. This percentage can be a handy tip if you’re trying to maintain lower consumption of particular nutrients such as fats, sodium and sugars or if you’re trying to increase consumption of fiber, protein, or micronutrients (vitamins & minerals). *% Daily Value is measured based on a 2000 calorie diet, so it isn’t a good measurement basis for everybody. * Also note the nutrients that provide a %DV. Almost all of the nutrients except for Sugars and Protein. Protein is because everyone’s needs are different, but Sugars on the other hand, there is no clear reason why it is not included. Tip #3: Everything in moderation. An item may be high in a particular nutrient, which could deter a choice. But if you have something higher in sodium at lunch, then make sure what you eat at dinner is more fresh and less processed to balance it out. Tip #4: Look at the INGREDIENTS list. 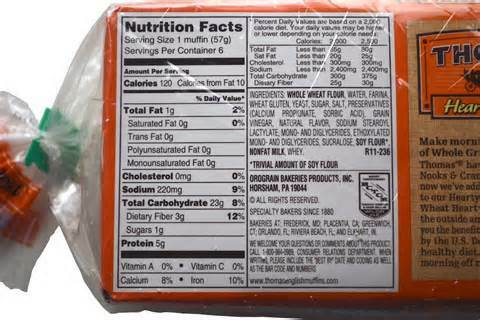 the Nutrition Facts label also contains an Ingredients list at the bottom. This is where you can find all the food items that are in the product. This is helpful when you are trying to identify specific items such as allergens or things you’re trying to avoid like food additives or sugars. The label below is analyzing sugar content of the product. The World Health Organization recommends we not consume more than 5% of our calories from “added” sugars, meaning sugars that aren’t naturally contained in the product. Lactose from white milk and Fructose in whole fruits are part of it’s natural make up and do not contain added sugars. Items like fruit juices or chocolate milk, can contain “added” sugars for added sweetness. The Total Carbohydrate line considers all carbs, like Fiber, Natural Sugars and Added Sugars. With the current food label, it is difficult to identify how much of the sugar grams come from “added” sugars. A new food label is being approved, and there is consideration for adding a line to identify how much added sugar is in a product. 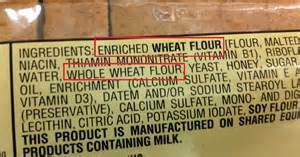 Another great reason why the ingredients list is important is it helps us identify if we are purchasing a whole grain product. If the first ingredient doesn’t contain t he word “whole” such as “Whole grain”, “Whole wheat”, or “Whole oats/barley/rye” then the product cannot be considered a Whole Grain product. There are lots of types of Wheat Bread, but if Whole Wheat flour is listed 5th on the list, then it is NOT a Whole Grain. …therefore it is a Whole grain product. … Enriched WHEAT FLOUR. Whole Wheat Flour isn’t listed until a third of the way down the list. Therefore, this product is NOT a Whole Grain. This entry was posted in Healthy Living by Laura Liechty. Bookmark the permalink.